A) Want to avoid certain gifts as your child has a birthday coming up and you’d like to keep your sanity. B) Have a birthday party to go to and you don’t really like the child (or their family) so want to get them a nightmare of a gift (yes, I believe people like this really exsist). C) You’re an Aunt/Uncle/Godparent/Good friend and want to really piss off your brother/sister/best friend without fear of repercussion because you don’t have children. If any of the above apply to you, you’ve come to the right place! Gelli Baff is sold all over the place. It’s the kind of item your kids see advertised on TV, or on the shelf in Toys R Us, whine their heads off about trying so you cave in, but then instantly regret doing so because it’s POINTLESS and MESSY and causes DRAIN BLOCKAGES! (If however all of those reasons listed above sound fun, feel free to buy some). Follow the box instructions at your peril. My experience of this stuff was not great (if you haven’t guessed that already). The kids flicked it at each other and it was stuck in their hair and around my bathroom for weeks. It was like there’d been an explosion in a Haribo factory. It also wouldn’t dissolve after use (this is explained below) so I had to scoop it all out of my bath manually through fear of blocking the drains and having to get someone out to unblock them at a cost of £500/hour. A cheap present which can cause extensive destruction and possible loss of sanity. Ah, Hama Beads. Minature plastic tubes of evil. Now, these things have been on the go since I was a kid (but I only ever did them at a friends house, I was never in possession of any of these things and now I know why…sensible mother, very sensible). Kids, unfortunately, love these things. 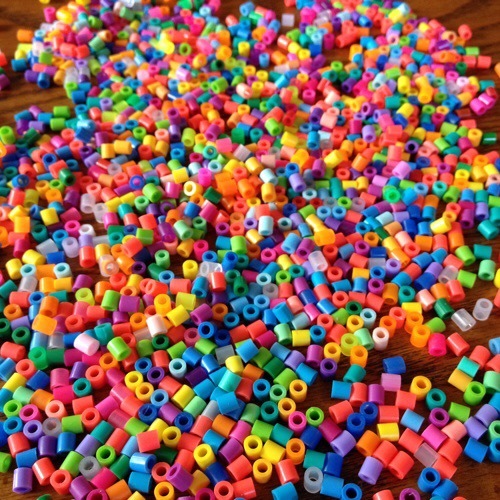 You stick the beads on a little peg board in the pattern/picture of your choice and then, once finished, you put some waxed paper on the top and iron it until the beads can’t take the heat anymore (much like me when my kids have asked to play with said beads) and melt together to create a picture. The principle of these things is fun and creative. The reality is anything but. The beads are tiny, so you can only play with them if there are no babies or toddlers around. Your child required a certain amount of common sense, patience and trust to play with these things, if your child doesn’t possess all of these qualities, bin the beads!!! I know this because I trusted my then 5 year old to play with these Hama Beads (supervised still) because I deemed him sensible enough to know not to put them anywhere other than the peg board. Mistake. Assumption leads to failure, I’ve told you all this before. Another reason these things are a nightmare is the perilous transition of the unstable creation from work table to ironing board. I’ve lost count of how many times I’ve got the shakes (through nerves, not lack of Gin), put it down on the ironing board too hard or tripped over something, resulting in all the beads falling off and my kids having a mental breakdown (“you’re the worst mum ever!! !”) because I’ve destroyed their hard work. All in all, I’d say these are a pretty great toy to buy if you want to cause disruption to a day’s plans by having to visit your local hospital due to one being stuck in an orifice or you’ve burnt yourself trying to iron the buggers together. My last review is of this stuff. Moon Sand. It’s a mutant substance which looks like sand, sticks like playdoh and then crumbles again when picked at (or hit with a fist). It also smells of plastic and will leave your hands smelling like it for a day or two as well. The sand stuff itself comes in plastic bags and, depending on which set you buy, it also comes with Moulds, mini tools and toys to hide/stick in the sand. One of my boys got this dinosaur one for his 4th birthday and it was a nightmare. He was Dino obsessed at the time, so the thought of being a paleontologist digging for Dino bones in the ‘sand’ was super exciting. I knew the stuff would be messy so i prepared myself as best I could with table cloths, Apron, dustpan and brush and gin. The sand itself stains. If you get it on any clothing or surface, it WILL end up that colour for a few months. You have been warned. I think that, because it’s kind of sticky, it adheres itself to pretty much any material pretty well and it also likes hair. It’ll stick to that pretty well and attach itself to your child’s scalp for a few weeks at least. Also, it’s sand. Sand is a bugger at the best of times, even when it’s outside. Who the sodding hell thought that letting kids play with it indoors was a good idea?! 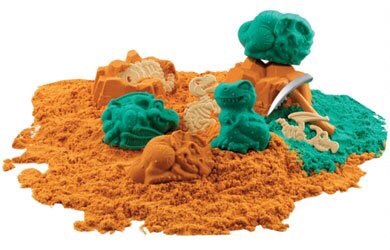 It got flicked around everywhere in a Dino excavation frenzy and I was finding green sand on the floor and down the sofa for weeks afterwards. From now on, this is an outdoor activity and the stuff is never to set foot indoors again. Moon sand Status: Extinct. So there we have it folks. 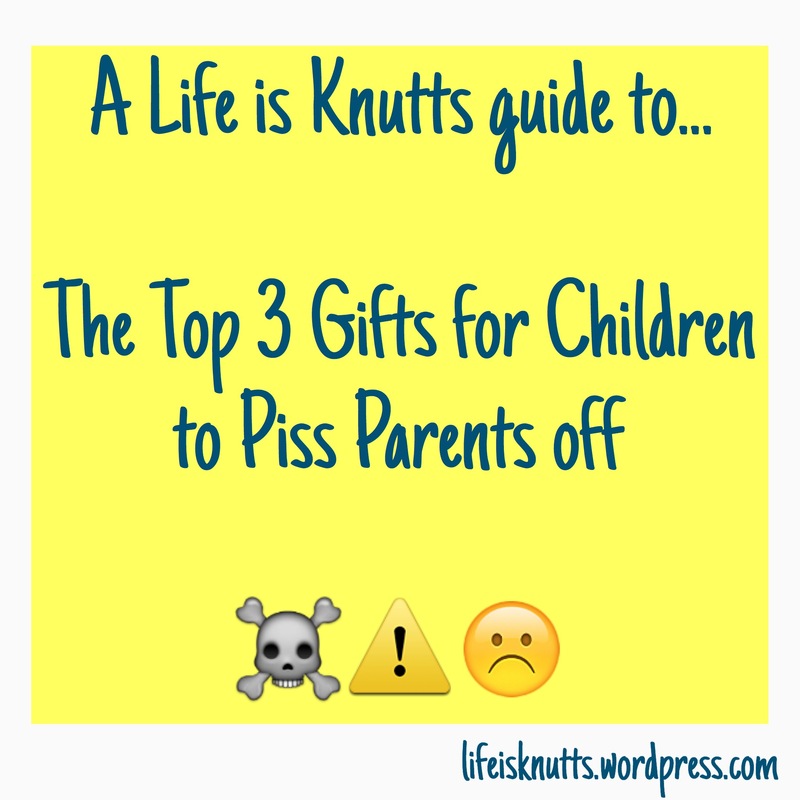 My top 3 gifts for children, guaranteed to piss parents off. I hope you found these comprehensive reviews useful and if you happen to be in possession of any of these items, do yourself a favour, either bin them or wrap them up and give them to someone as a gift….then run for the hills!!!! Thank you for the warnings! I think we have some of the beads (we certainly got some beads you have to iron, but I couldn’t work it out and put them on a high shelf) but I suspect i would have been enticed by the sand as well… eeek. Haha yes especially the first one I mean really who would you would have thought it was good idea to make a jelly ‘baff’? Only the minds of sadists who want to see the parents suffer. On a similar note – I did once have a ball of gloop as a kid – I spent one evening with my cousin who was sleeping over throwing it at the wall to watch it stick and fall down. In the morning we realised it had left marks all over the wallpaper – my mum was fuming! I totally agree with moonsand! It’s dreadful stuff! The little one thinks it pudding and keeps trying to eat it and gets disappointed, and the bigger one manages to spread it all around the house! I’ll consider myself warned for the others! Visiting from #twinklytuesday and thoroughly enjoying your blog! Well I bought my daughter tins of Hama beads and luckily they have been kept in a box and not all over the floor, however we do have some other beads, a set someone bought and it was one i did not fancy doing with my daughter and today i ended up sweeping them all up in the room and throwing them out so i agree, gifts with beads are a big no no! Excellent! I will make sure I buy these items for my grandchildren when birthdays come around! Thanks for the advice!